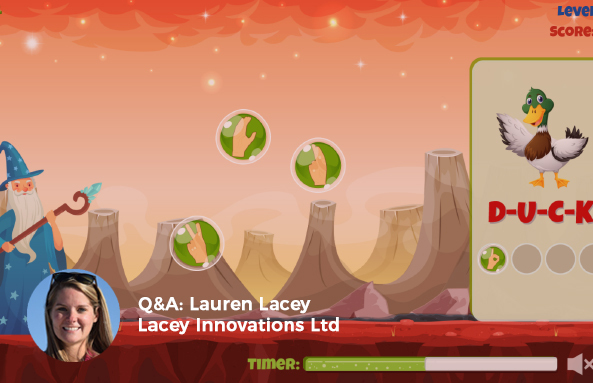 As the second instalment of our creators Q&A series, we caught up with Lauren Lacey, who runs Lacey Innovations Ltd. Lauren and her team have been working on some really exciting new games for the Curious World app, to help kids learn about everything from animals to sign language. 1. Firstly, tell us a bit about you and your team. Hi! My name is Lauren Lacey and I own a company that develops educational games and videos for kids. I have my bachelor’s and master’s degree in mechanical engineering and have been working in education for the past 3 years. The team and I started working together about 2 years ago and we absolutely love what we get to do. We get to make things that help kids explore and learn about the world around them! We all have different backgrounds and schooling, but we team up together to make incredible things. 2. Can you talk us through the process you go through when creating new games? Definitely! The first step is that we must decide on a topic to teach. Topics could be “counting from 1 to 10” or “where do animals live” or even “what do dinosaurs eat”. Once we figure out a topic we then brainstorm about how the game will work and how the kids will interact with the game. This helps us out a bunch, because this step shapes how we design and code our games. Our designer then gets to work on designing all the pictures and backgrounds for the games. We call these designs our assets. These assets are then sent to our coders and they write the code with the design assets to make the games move and play. We then find sounds for the games and do a bunch of testing on the games to make sure they play how we wanted. And that’s it! The game is now ready to be added into the app! 3. How did you get into creating games for kids? I actually helped start a kid’s educational website a few years ago and sold it last year. 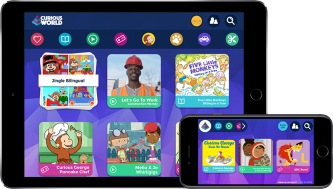 When we were developing the site, we noticed how there was a need for more educational games on apps and on the internet to help teach new topics to kids. This is where we started developing educational games. The team and I absolutely loved developing educational games, and we didn’t want to stop after selling the company. That is when I reached out to Curious World. Now we get to continue to develop educational games and continue to help teach thousands of kids around the world! 4. Tell us a bit about your experience in creating content for kids? I started creating educational content for kids about 3 years ago for a website called Kids Know It. I absolutely loved the process of developing something that I knew would make a positive impact on kids. My team and I have developed a bunch of different educational material for kids and teachers. We have created posters, coloring sheets, website pages, games, and videos. The best feeling is when we get to see kids or teachers using some educational content that we created and seeing the kids enjoy learning. 5. What is it about creating content for kids that you like? The best thing about creating content for kids is knowing that you are creating something that will help kids learn in a fun way. I also love getting to be super creative with colors and sounds and making things goofy and fun. When we develop these games, we get to be kids again! Who wouldn’t enjoy that! 6. What do you think are the most important things today’s kids should be learning at a young age? I think the most important thing is for kids to learn that learning is fun, and it is good to be curious and ask questions about the world around them. Some of the smartest people to have ever lived on this Earth were smart because they asked questions and tried to understand why things worked the way they did. They enjoyed the process of learning and weren’t afraid to fail or appear not smart. We need to teach our kids that it is ok to fail, and that it is more important that they pick themselves back up and try again. 7. What is the key to making games that are not only fun, but educational too? Hmm...I think the key is to make things challenging but not too challenging. I try and design games similar to games that I loved when growing up. The ones that I played over and over were the ones that I couldn’t solve instantly but could tell that I was getting better and better the more I played them. Ha, I still love those types of games.